MEXICO CITY, Feb. 12, 2019 /PRNewswire/ — Mexican entrepreneur and GO GABA founder Jose Antonio Del Valle has launched the campaign Iwantmybusinessback.com on the web and in social media under #iwantmybusinessback in order to receive advice from entrepreneurs and the public in general on how to bounce back from an unfortunate series of events that led him to lose his business. The founder of GO GABA wants to raise his voice and invite the public in general and other entrepreneurs to share their own experiences. Mr Del Valle stated: “I am convinced that there are many people experiencing similar issues while following their dreams. People that never managed to accomplish their dream, or lost it somewhere along the way for different reasons. With this initiative, I want to present my business story and hear what others have to say.“, says Mr Del Valle. 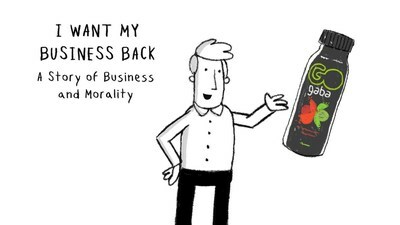 “I Want My Business Back” is an initiative launched by Mexican entrepreneur and GO GABA founder José Antonio Del Valle in order stimulate debate for entrepreneurs on how to grow new businesses and bounce back from any potential unsuccessful ventures.